This Valentine's Day... Fall in LOVE with NBCUniversal! The entertainment giant continues to Think Chapman First and recruit Chapman students to join their respected internship program, Campus 2 Career. 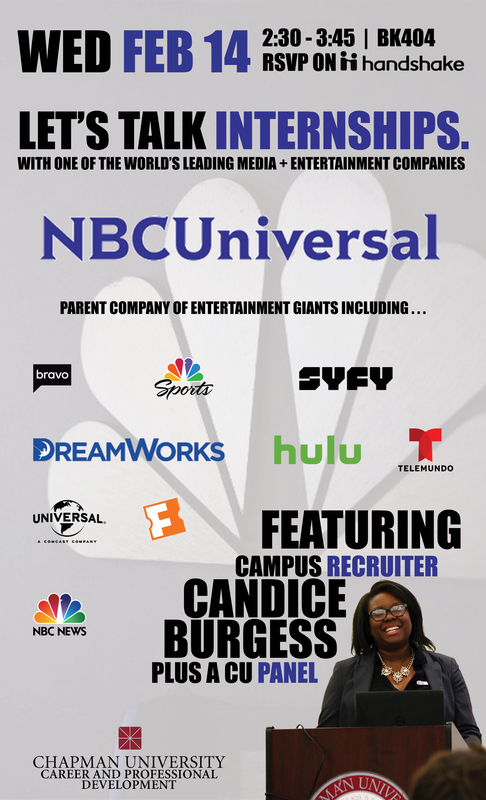 Find out what it takes to land and thrive in an NBCUniversal internship directly from one of NBC Universal's Recruiters, Candice Burgess. Plus, look forward to gaining an inside scoop from fellow Panthers who have worked or interned at the company. Plus a Chapman Panther Panel! You can contact the event organizer, Career and Professional Development at career@chapman.edu or (714) 997-6942.